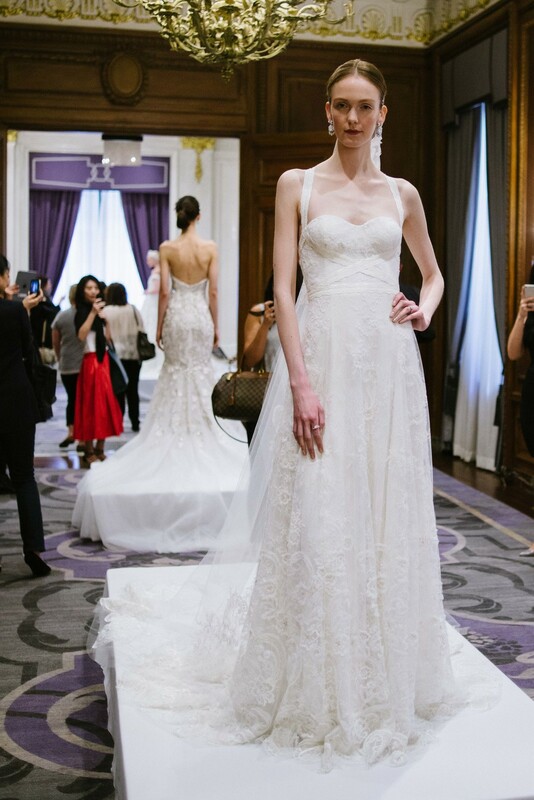 The team of buyers at Little White Dress Bridal Shop has just returned from Bridal Fashion Week in New York, where we saw the new Spring 2016 collections (in store this fall!) from the best bridal designers. Part of what we love about bridal fashion is that passing trends aren't as important - after all, most brides are going for timeless rather than trendy when they choose their wedding dress. While we wouldn't call them trends, we do love seeing all the beautiful, innovative ways our designers make their bridal gowns fresh and exciting season after season. And because it's so important to us to bring inspiring bridal fashion to brides in Colorado and beyond, we are always on the lookout for the best of the best in bridal fashion. Here is what inspired us most this Bridal Fashion Week! Designers are giving Princess Brides a promotion to Queen with these stunning takes on regal romance. From royally-inspired sleeves, skirts, embroidery - complete with crowns, in some cases - we loved the regal romance in looks by Naeem Khan, Marchesa, Anne Barge, and Galia Lahav. Laser-cutting, 3D printing, and other modern technology are influencing fashion, and bridal designers aren't afraid to take part in the form of florals. On everything from skirts to sleeves and bodices, these texturized flowers use everything from chiffon, crystals, and even feathers, to achieve a 3D effect on gowns. These examples from Jenny Packham, Marchesa, and Claire Pettibone Romantique were our favorite examples. The concept of changing your look from the ceremony to the reception - without changing into a second dress - might be one of the biggest ideas in bridal fashion at the moment. Detachable overskirts and trains are an easy and elegant way to change up your look, and the options designers are offering are simply gorgeous. What we love about the looks shown by Reem Acra, Claire Pettibone Romantique, Naeem Khan, and Galia Lahav is that they accentuate the dress, and don't cover up the whole bottom half of the gown. It's all about adding a touch of volume and drama for the ceremony, and not about having two completely different looks. 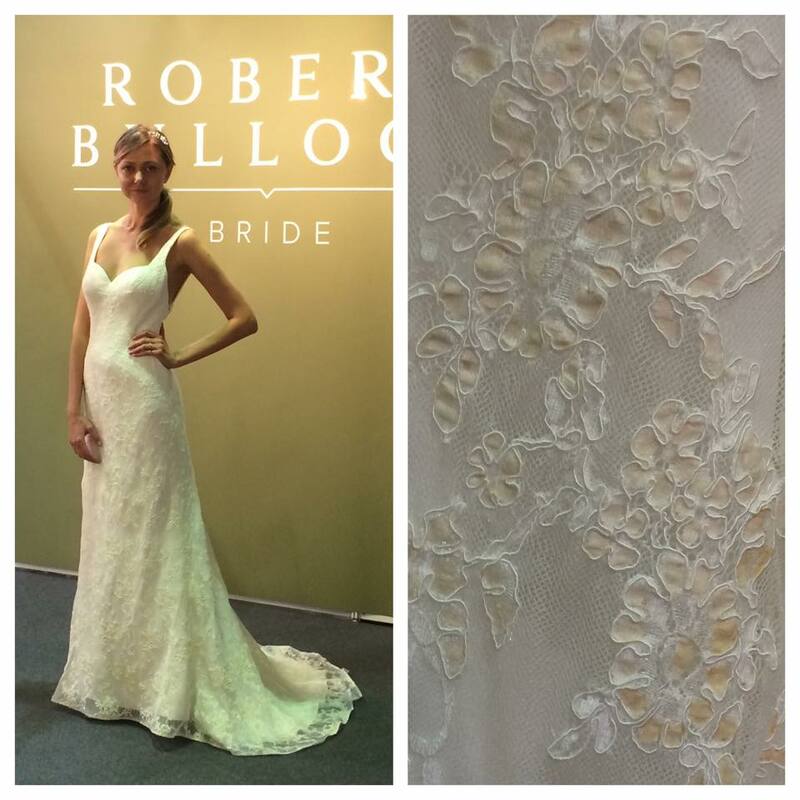 This Bridal Fashion Week we enjoyed seeing subtle homages to a classic fashion inspiration - ballet. From scoop-back styles to wispy tulle skirts, and lace-up bodices reminiscent of a pointe shoe's ribbons, a little ballet influence is a great way to infuse feminine sophistication into your wedding day look without veering into sugary territory. We were particularly enamored with styles from Marchesa, Liancarlo, and Galia Lahav. 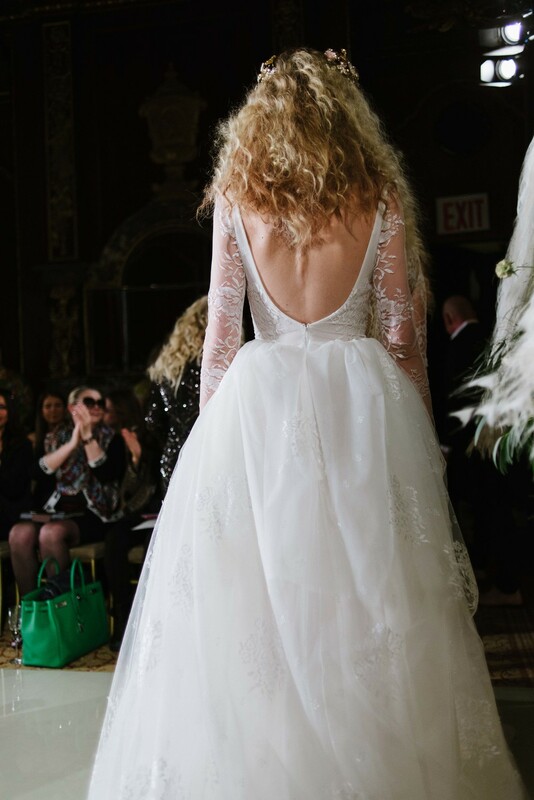 Plunging low backs remain big in bridal fashion, and this season we saw a new touch to the style: the belted back. Whether with a simple satin ribbon, or a glamorous beaded version, these belts are a clever and beautiful way to accentuate the waistline on low back (open or sheer) styles. Liancarlo and Galia Lahav hit the nail on the head with this new look. Designer wedding gowns are the product of visionaries and artists in design and construction, but a literal artist's touch infused some very special gowns this season. 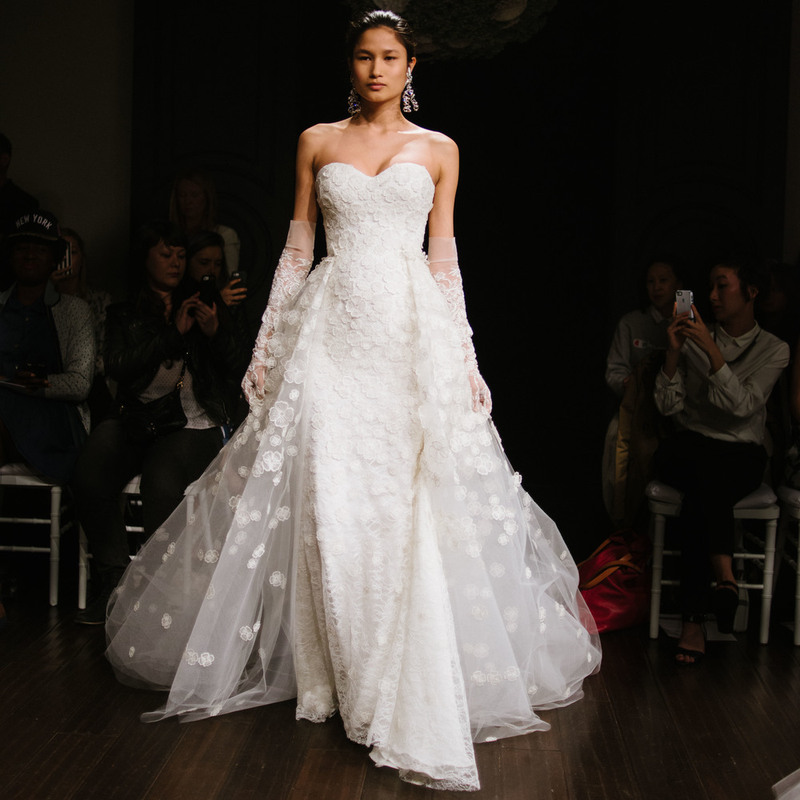 With hand-painted tulle and lace, as well as carefully cross-dyed lace, creations by Naeem Khan, Claire Pettibone Romantique, and Robert Bullock Bride left us in awe of the wearable art they have created for brides on their wedding day. Blushes and blues continue to dominate the non-ivory color front on wedding gowns, but this season we saw several sand-colored dresses as well. The neutral, earthy palette is perfect for a variety of skin tones, and a subtle way to make a statement. We're imagining these gowns on a bride at a gorgeous outdoor wedding, with bridesmaids all in white for a fun twist on tradition. The versions from Jenny Packham, Liancarlo, and Anne Barge made us hope that this color sticks around for several seasons to come! Which Spring 2016 wedding dress styles are you most excited to see arrive at Little White Dress this fall? Call 303-814-8972 or visit our website to make an appointment to see our selection of always-current, best of the best wedding dresses, accessories, and shoes!